The importance of preference management in ambient assisted living is vital to provide systems that are better prepared to meet users’ expectation. Various ways Artificial Intelligence handles preference management exist, and survey research was also conducted to identify effective and existing handling methods; however, the survey indicates that most lack the ability to handle ambiguity Oguego et al. (2017). The research current aims to identify an effective way to represent and reason with users’ preferences along with a flexible interface to enable users rank their preferences. Preferences sometimes are in conflict with each other. For example, sometimes there may be reasons to keep the lights on and also reasons to keep them off. The basic idea of argumentation is to create arguments in favour of and against a statement in order to determine if that statement can be acceptable or not and why. The researchers believed that time-based argumentation is an option worth exploring, offering advantages that the methods which were identified in Oguego et al. (2017) could not offer. Using argumentation we were able to develop a conflict resolution system that compares two or more conflicting arguments (figure 1). In addition, Oguego et al. (2018) introduced a new sort preference (pref) which is now included in the order of precedence, allowing user to specify their preference using a flexible interface that will be used to give some suggestions to the user when there’s a conflict in the preference(s). The interface was developed to give the user the ability to prioritize their preferences in the manner they want and also give them the ability to modify their anytime as this is mobile app that can be used with a mobile phone. 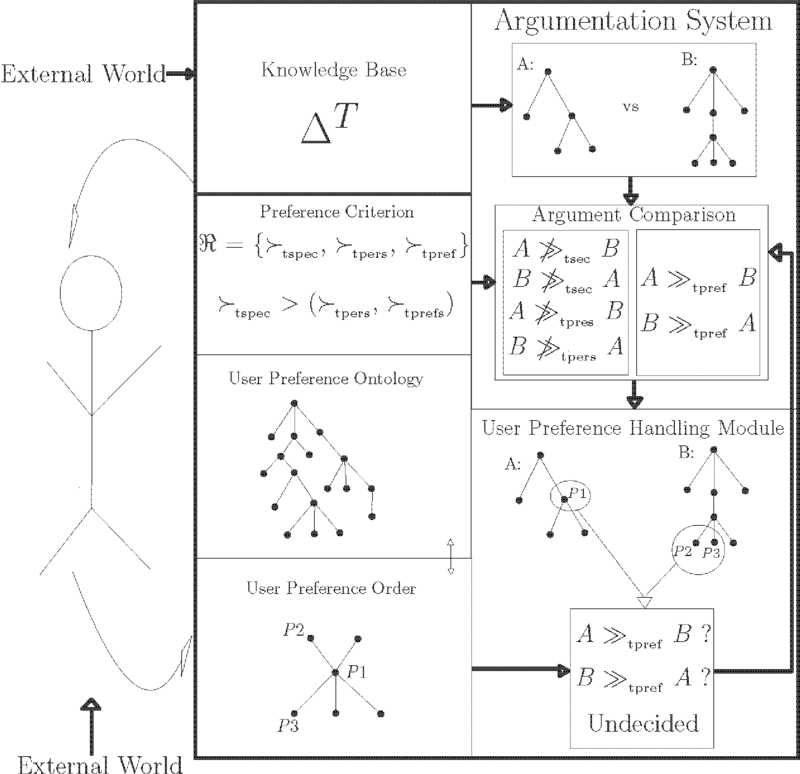 Combination of the interface, reasoning system and conflict resolution system (argumentation), users’ preferences are being managed effectively in a smart environment. Figure 1: Overall Preference Architecture. Oguego, C. L., Augusto, J. C., Muñoz, A., & Springett, M. (2017). A survey on managing users’ preferences in ambient intelligence. Universal Access in the Information Society, 1-18. Oguego, C. L., Augusto, J. C., Muñoz, A., & Springett, M. (2018). Using argumentation to manage users’ preferences. Future Generation Computer Systems, 81, 235-243.